I'm sure Tina will be along shortly, but this will get us started. I am gone for a second and woah! Thank you, Jan. I am glad to see Eva and Sir Ridley are there too. I hope they all have well-deserved rest, and enjoy their time there. And friends, it has started. We are now officially riding the wave of KOH "madness." And am loving every single minute of it. ETA - BTW, does anybody else think Eva has way too much makeup? She is a beautiful lady, but I think all that make up is too much, and makes her look a bit harsh. Woo hoo!! :cheer: Thanks, Jan.
ETA: He's wearing those pants again. I've always known it, but it didn't fully hit me until just now. Orlando has got incredibly beautiful eyes! The colour, it's just. I don't know, surreal. *sigh* He is going to be the death of me yet. I couldn't agree more Katharwen! They are like polished mahogany - deep, rich, luscious! Thank you so much for the pics Jan! Can't wait for more! *Gasp! * Oh, thank you my esteemed enabler! That smile. le sigh . What a beautiful man, both inside and out. That light reflection in his eyes! It's making me go all gaga! It appears to me as if they took out his hair extensions for the press junkets, as I certainly don't see a ponytail. More pics! Thank you for posting these! I absolutely love the scarf. But can someone please get him to stop wearing those horrible pants? If I sigh at these pictures coming in much more, I may pass out! I do not hold any of you responsible however, keep them coming. Just fabulous! Thank you, thank you! 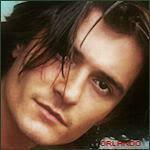 I'm off to trawl the video clips now Orlando overload for my lunch hour - yummy!! Is it just me, or is that a black version of the white shirt he wore for the ET and E interviews? Not that I mind.just curious. And all I could do was one loud Squeeeeee!!! And many, many quiet meeps and gasps. Those eyes! 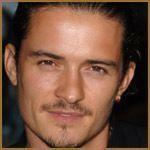 Orlando's magnetic personality is so evident in this picture. So vibrant and full of life, with those deep chocolate eyes reflecting the goodness of his soul. Thank you, Jan! You are truly the omnipotent Orlando handler. Yay, he's wearing my favorite pants! I love those pants for some reason. I think Eva was going for a punkish look - note the fuschia tights - and it just doesn't translate well on film. Thank you Jan, for these picture of this beautiful man! I'll just sit here at my desk and until I pass out from dehydration. Thanks so much, Jan for these pictures. He looks great! 1) Tossed it into a washer. 2) Let it dry quickly WITHOUT shaking out the creases and. 3) Hurridly thrown it into a travel bag! Don't you just love his style! Ridley is actually SMILING in a couple of those pics. Note to self: must clean up picture folders for more incoming. ETA: TF, I don't recall seeing Ridley or Eva in those pics.